Whats up! I’ve been itchin to do a good ol’ fashioned feature for a while, but wanted something that was worth sharing to the community. S0 here we go! Meet Austin from sunny rancho cucomonga, CA. This is someone who is truly passionate about his cars, and maybe some of you might have seen his past projects like the 89 hatch that has been on the site in the past. Austin has since stepped it up to another level with his Z. Sponsored by VIP Modular wheels, the car riding on a set of their VX wheels in 18×12 -6 in the rear and 18×10 -9 in the fronts. A quick glance inside the car will give you a steady dose of that VIP theme with the JP curtains, neck pads, and fusa rope, LV A pillars, back panles and tops off with some Bride zeta 3 buckets. All in all, this car carries that “Don’t talk about it. Do it” theme as it reflects the personality of the owner; a classy car with the nuances of the sports car at heart. Hope you guys appreciate it! NO huge titles/magazine captions. Just photography. Shot exclusively for fatlace.com and the slammed society blog. sick pictures! last picture*** takes the cake. Nice feature Cliff and nice story. Good work on the photography. I’m loving the rawness of the photography without flashy print. Keep up the good work! Sick car, fitment is clean!! Looks like a lot of work and love went into the car, and it shows. SICK photography! In love the composition. I’m glad photographers are looking at things that set their pictures apart from the rest. 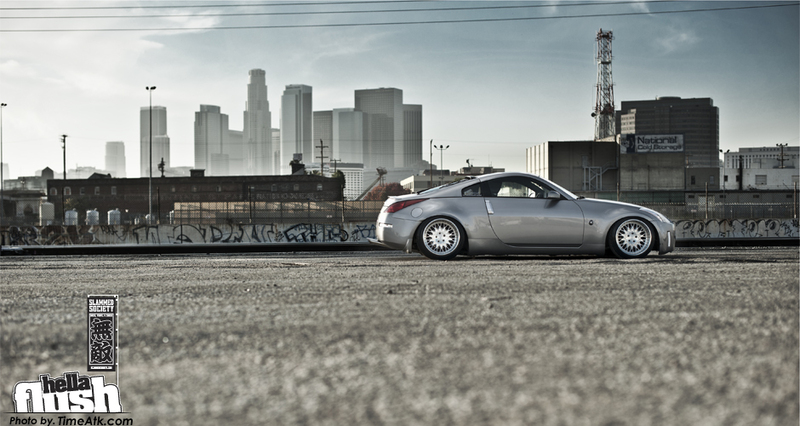 Can’t get over how you captured that LA skyline; gives a strong vibe on the LA automotive lifestyle. Cliff doesn’t get caught doing anything but the best. Great work and awesome location! Full VIP treatment on a 350z. I’m just a little bit confused. And arent the curtains supposed to be installed ON the door, not just hanging there? Great pictures!! exhaust is MEEHHH but very clean Z nonetheless. 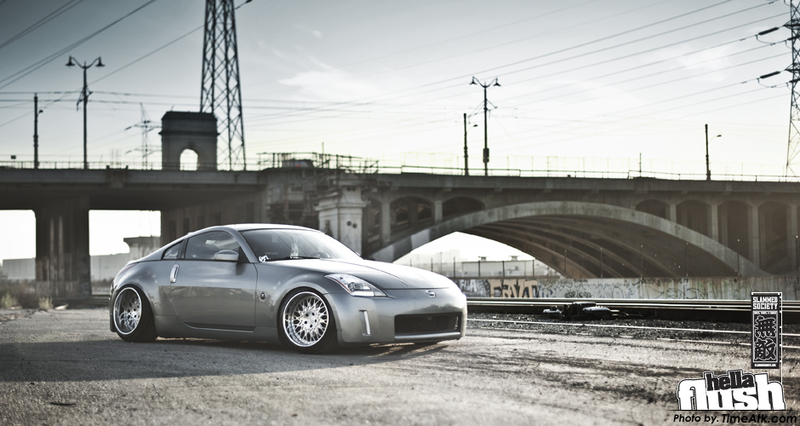 nice pics, and sweet Z. wish you had more angles than just a side profile really. its all good your pics are awesome plus it looks like a sweet photo spot. I was just sitting and thinking about how will these wheels fit my 350 Z. Now I’m sure it will be awesome. Pictures are just not less than perfect. Which one in front of it? idk where those two even came from i bought it like that. VIP? Really? I dont see it. But the photography is very nice. Awesome job Cliff! The Z is amazing. 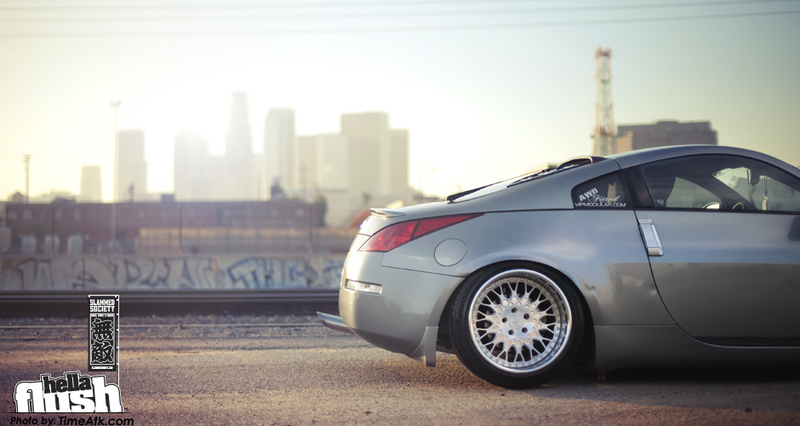 The awkward exhaust with ugly vip wheels and vip accessories on a Z is just …. well awkward. Could of put some effort out for a cleaner theme imo. Great photos though. Nice work Cliff! Love the profile shots, what lens were you using for the last two? Thanks for the comments guys, no surprise a build like this will get mixed reviews, glad some appreciated it though! any word on what suspension he is on? the Z stands for zerg right? The car is nice too. I like how so many jack@ss people like to put down something that is not their taste. My bro Austin’s Z is dope. With these pictures are sick as well! Pleas tell me what exhaust that is and where i can get one =D thanks. Do you know, wheter it was used a camber kit, or it’s just all original suspension? well it is my car lol so your asking the right person, on stock camber arms with upgraded camber bolts. Thanks. Could you please also give me your tyres size ? Fr. and Rear. WOW. 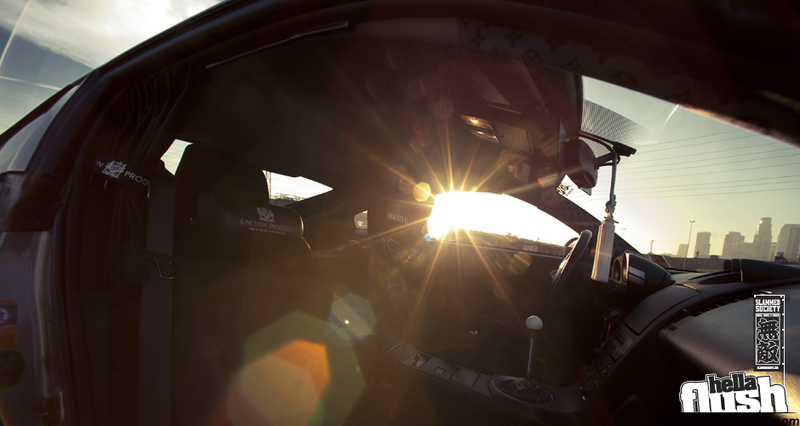 sick car, sick shots! Sick ride, not diggin the victory pipes tho…doesnt really suite the car. still pretty dope ride tho! VIP status, hellaflush, then a bride racing seat..??? Looks like the car got lost a bit in the build process, might aswell lose the bride seat and go full VIP now..